Here’s Aronian’s nice endgame win over Leko from Tata Group A. For more see Tatasteelchess. The site has a fantastic gallery. 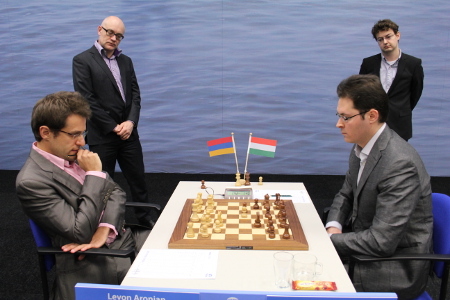 Aronian obtains a better pawn structure but Leko has the bishop pair for an active defence. Later the ending is BN-BB but with Aronian having an extra pawn. Schandorff proposes 4.e3 against the Nimzo-Indian with 5.Nge2 in Playing 1.d4 The Indian Defences(Qualith Chess 2012). I verified game 4 where Schandorff proposes the aggressive 8.Qf3/9.g4 plan. White imposed a sharp game in the 2004 Aronian stem game. I found some independant improements and present these findings. My first outing with 4.e3 did not go so well so now additional work must be done to upgrade my knowledge level. This analysis is part of the hoped for ‘cure’. Bayonet type attacks are common the Open Sicilian but not so much in the Nimzo-Indian. White has the bishop pair deep in the ending. How should white make progress?